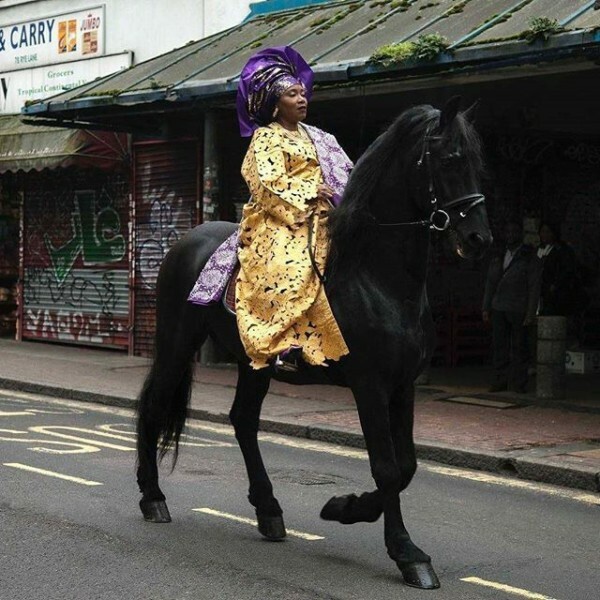 You’ve probably seen the photo on the internet: a woman in yellow iro and buba, a towering purple gele, seated gallantly atop a horse. The photo was taken from a short film “Entitled” by British-Nigerian filmmaker Adeyemi Michael. Amidst Britain’s planned exit from the European Union – Brexit – and the rising nationalist movement across the world, Adeyemi decided to explore what it is to be an immigrant. The immigrant experience can be a jarring one, constantly straddling the line between two cultures. The filmmaker approached it from a personal perspective: he reimagined his mother’s idea of moving from Nigeria to Peckham. “Entitled” features Abosede Afolashade who narrates her experience as she rides on a horse, a talking drum playing in the background.